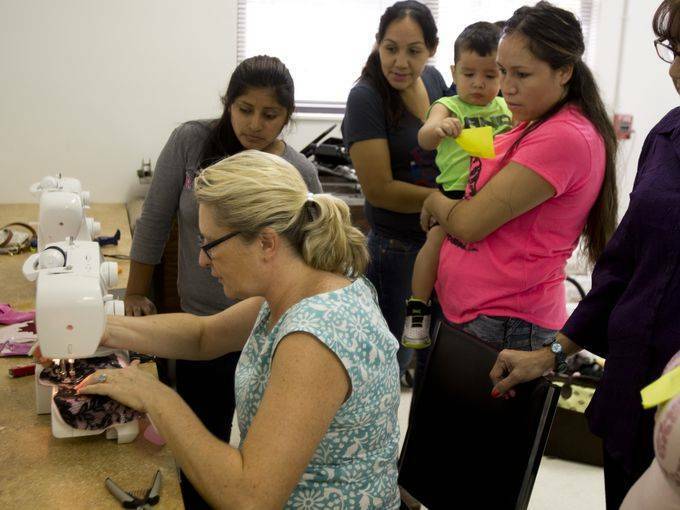 The Handmade in Immokalee sewing class was the topic of a recent article by Naples Daily News reporter, Maria Perez. The sewing class started in November 2015 and is led by fashion designer, Gwendolyn Gleason. Each week, she works with students who are interested in learning to sew, whether for their own family, or to generate income for their family. Several elementary and middle school students are also taking advantage of the summer break to attend the sewing class. The long-term goals for the group include helping participants learn new skills, increase self-esteem, and generate income. Gleason hopes to have the women complete enough products so she can sell them on the group’s behalf in Naples during season. The class meets Wednesday mornings from 9:00 am to 12:00 pm at the Roberts Senior Center in Immokalee (905 Roberts Avenue). For more information or to donate sewing machines or material, contact Dottie Cook at 239-658-3315. Click here to read the full article.